So last night, I had a nice quiet house to myself. I dropped the girls off at my parents and went directly to the Whole Foods near their house. They were having a great deal on mussels, so I bout a pound for under $5. I also got 6 chicken quarters for under $6, but that is for another post. My husband was also out for the evening, so I found myself with a bag of mussels, white wine, and a loaf of crusty bread. I researched a few recipes and came up with this recipe. It was divine. 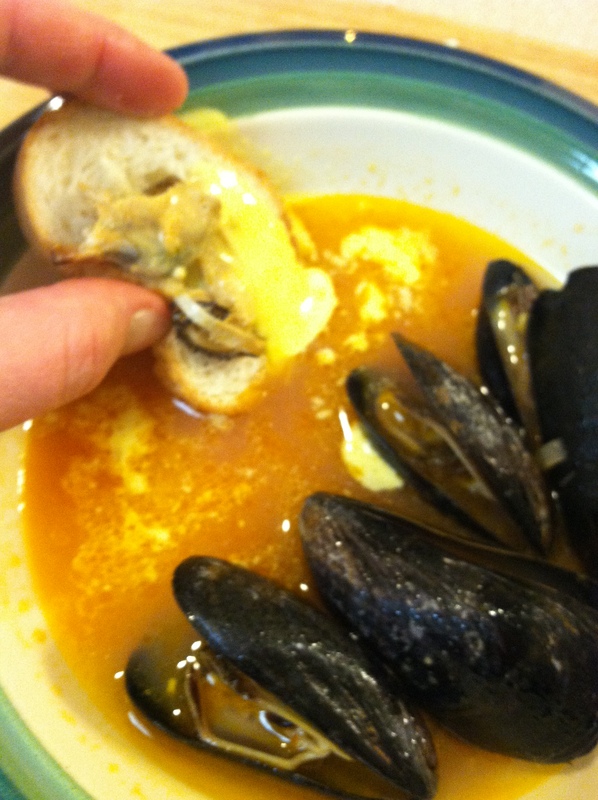 I at standing up dipping mussels in sauce, then aioli, then on bread etc. all the while licking my fingers and forgetting all the manners I ever learned or taught to my girls. I will cherish that night in my memory until the next time. Everytime I get stressed, I will think back to the time I stood at my counter and demolished a pound of mussels, a half a loaf of bread, and an entire bowl of aioli all washed down with lots of white wine =) Happy momma! I blended it all together in my blender on the lowest setting. You could whisk if you felt like it, but this is much easier. Add 2 tablespoons of olive oil to a large pot over medium heat. Add your onion and season with salt and pepper. Cook about 5 minutes, then add and cook your garlic, stirring for about 2 minute. Stir in your tomato paste for another 2 minutes. Add wine and bring to a boil. Reduce heat and simmer until liquid is slightly reduced. This will just take a couple of minutes. 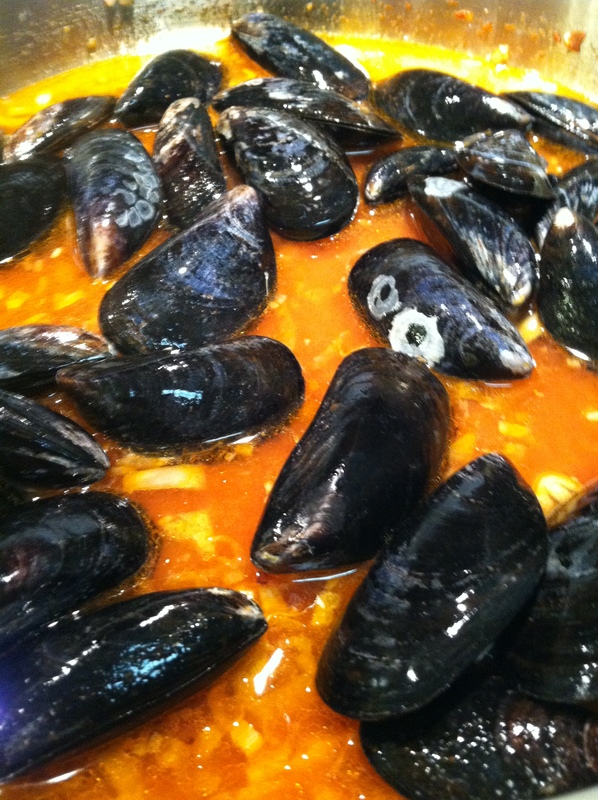 Add mussels and 1/4 cup of water to the pot. Cover and reduce heat to medium. Cook for about 10 minutes, stirring occasionally. Discard any mussels that did not open. They are unsafe to eat. Ladle mussels and broth in to shallow serving bowls and serve with bread and aioli. Trick to eating mussels. 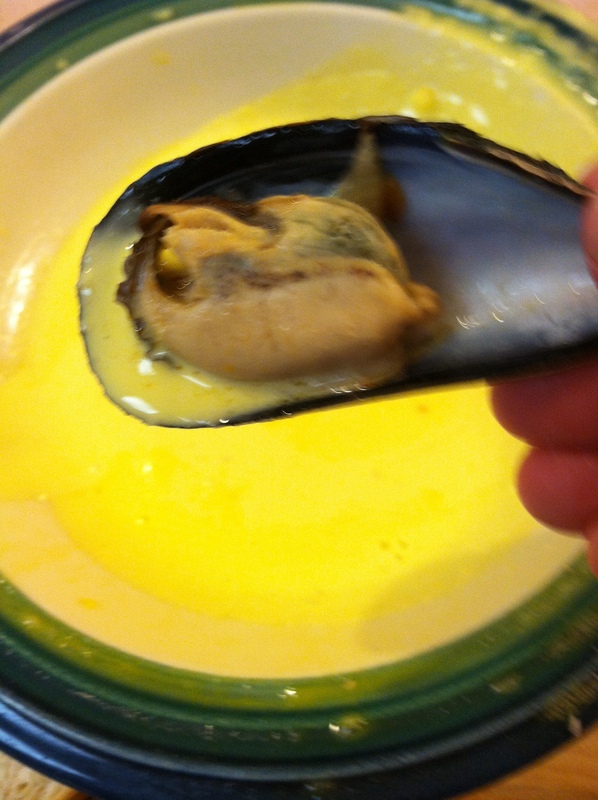 Once you get one mussel out with a fork, you can use that mussel shell like chop sticks to eat the rest of the mussels.